Size: 327 sq.ft. - 1406 sq.ft. Nshama Group has recently introduced a new addition to Town Square development - Safi Apartments. This premium housing project hosts Studio to 3 BHK homes in the prime location of city in Mudon, Dubai. It is crafted among Cinema, Hotel, Swimming Pool, 350 Stores, and four wheeler Parking spacesat unmatched rates starting from AED 349,998. This phase of Town Square is being addressed as a reward with a true urban living lifestyle to cherish every positive moment here. * Studio apartment is covered with 327 sqft area. * 1 BHK flats are offered in 518 to 550 sq ft.
* 3 BHK are in 1277 to 1406 sqft area. Every unit of Safi Project is decked with a wide open balcony and large open terraces to admire the beautiful surroundings of this project. Nshama Group, established in the year 2014. One of theleading real estate developers of Dubai. The group have been offeringhigh class communities by structuring smart and sophisticated designs. Apart from developing green neighbourhoods the developer ensures high-powered living as it aims to develop 5G communities that will offer free Wi-Fi and fully FTTH linked areas assuring seamless connectivity. The company has been known for the residential and commercial developments of Town Square Dubai. It is an integrated construction near Al Barsha that features 3K townhouses and 18K apartments in addition to retail, hospitality and commercial phases.Nshama Properties vision is to bring a new lifestyle options to Dubai that transforms the lives of people. The Town Square "Safi Apartments" are sophisticatedly located in Dubai. It is conveniently accessible to iconic places like Palm Jumeirah, Burj Al Arab, BurjKhalifa, Palm Jebel Ali and many.Safi Homes are placed at a close proximity from Town Square with highway network for commuters. 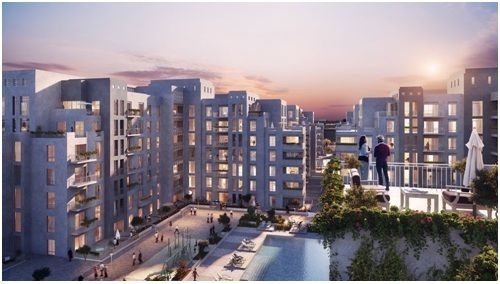 This place enjoys unmatched connectivity to all parts of Dubai.The township of Town Square is specifically designed with commercial and residential landmarks. Town Square is a paradise for Shopper’s by providing access to 350 stores in the venue.As well as the projected is also fringed with health facilities, school, parks and every facility. The Vida Hotel and Real Cinema for latest blockbuster films is quite popular in this location. The Safi Apartments by Nshama Realty complete address is Town Square, Dubailand, Dubai, UAE. Safi Apartments is a great infrastructure launched with fabulous specifications like Skate parks, Jogging track, Biking trails, Town Square Park, Community gardens, Outdoor and indoor Reel Cinemas, Central Air conditioning,Retail stores, Restaurants,Basketball courts, Football field, Outdoor gyms, Tennis courts, Swimming pool, Healthcare Clinics, Hospitals, Fire Fighting and alarm system and Parking space. 318 sq.ft. - 2334 sq.ft. 600 sq.ft. - 2000 sq.ft. 327 sq.ft. - 1406 sq.ft.